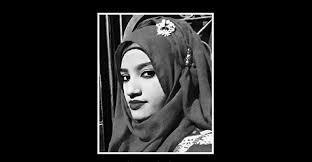 Share the post "Sinha Saga: More questions than answers"
The statement by the Bangladesh Supreme Court, issued a day after Chief Justice SK Sinha left Dhaka for Australia on “leave”, raises questions one can hardly avoid. 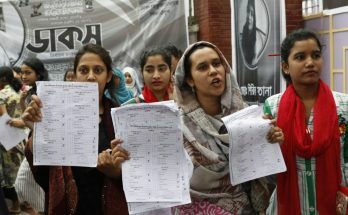 The statement alleges that the CJ faces “11 charges” which include money laundering, graft, moral turpitude, and informs that details of these “charges” were handed over by President Abdul Hamid to the judges. We are aware of the background of the tensions between the CJ and the government since release of the full copy of the 16th Amendment annulment appeal verdict on August 1; they require no repeating. However, we shouldn’t forget the unkind reactions of the ruling party leaders inside and outside the parliament. 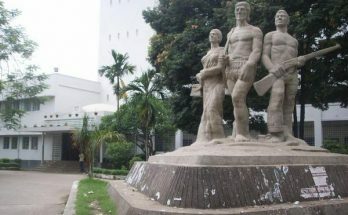 The visits of Awami League leaders to the CJ’s official residence immediately after the verdict were reported in the press. The vitriol against an incumbent CJ was unprecedented in the history of the country. Those who followed the event closely before this episode begun to unfold would be remiss if they didn’t recall the statement of a disgruntled retired Supreme Court justice who prophesied that Sinha will not only “have to resign, but also leave” the country. The discrepancies between the government’s statements, communicated by the law minister and the attorney general and repeated ad nauseum for at least a week by ruling party supporters, that the Chief Justice Sinha was sick and that he sought leave for the said reason, were debunked by the CJ’s statement on his way to the airport for his flight to Australia. “I am well,” he said in a written statement; he didn’t contest the news that he sought the leave but he said he would return to the court. The opposition political parties and others said that he was “forced” to seek a leave. While the ruling party loyalists were talking on social media of “graft” and other allegations in the past months, there were no official words. Instead there were repeated assertions that the CJ had cancer. 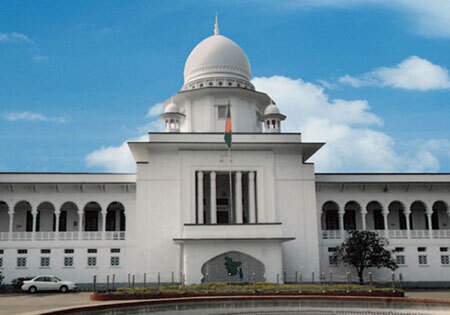 Equally interesting is that the ruling party supporters began stating that “five justices declined to sit in the same bench of the SC” even before the CJ left Dhaka and before an official statement to this effect was made—until the day after the CJ issued a statement and left the country. The timeline suggests a leak, if not a construction. The “allegations” of his misdeeds were never featured in public conversation or in the official narrative until August 1, 2017, the day the full SC verdict with observations about the state of governance, was released. Instead, previously Sinha was praised, among other things for being the first non-Muslim CJ in Bangladesh, a Muslim-majority country. The series of events that followed the verdict clearly demonstrated that the ruling party was angry, to say the least. The anxiety of the ruling party was quite palpable. Nevertheless, now the CJ is “away”, and—if we are to believe the AG—Sinha’s rejoining after returning home from abroad is “a far cry”. His tenure was to end on January 31, 2018 but it seems to have ended prematurely and ungraciously. There were questions surrounding the talk of “leave”, “sickness” and “vacation travel” by the government; the responses to them are not forthcoming. Now the “allegations” and the processes to deal with them engender further questions. These questions are far more important than those which preceded them. They are procedural and political. We have been told of “11 allegations” but it is left to our imagination as to what these specific allegations are. Who lodged these allegations? Who has the list? If these are allegations, which agency was entrusted to investigate? Was such investigation following the law of the land? How did these allegations, with “documentary evidence”, land on the desk of the President? Were any cases filed against the accused? Has Sinha been indicted on these charges? Why was he allowed to leave the country, in a well-publicised manner, when such serious allegations were known to the President (and understandably the PM’s Office)? Why was the smokescreen of sickness created, if the AG and others were aware of these “allegations”? These questions are premised on the universal dictum: “innocent until proven guilty”. The refusal of the Justices to sit with him on the bench raises questions too. The statement claims that the CJ was confronted by his peers and failed to provide “satisfactory” answers. If one was unaware of the impeachment procedure of judges, s/he would get the impression that there is an informal process of disciplining Justices. Alternatively, it could be assumed that the Justices had no recourse at their hand, therefore they took the informal route. The irony that lies here is that it was the Justices who unanimously agreed, not too long ago, that the disciplinary procedure should be at their hands instead of at the hands of the Parliament members, that it should be a formal process and it should be through the Supreme Judicial Council. Why was such a process not contemplated? To whom was the decision communicated? Was such intimation necessary? Should the Justices have waited and simply not sit? We won’t know the answers to these questions. As for the decision not to sit based on allegations, however serious they are, has that decision betrayed audi alteram partem—the right to a fair hearing? The members of the apex court will know better than a layman like me, whether a precedence is now set that neither a Supreme Judicial Council nor the parliamentary impeachment process is needed to act against a sitting Justice. If so, what will keep them immune from such procedures in future? Beside these procedural matters, there is the larger question of politics: this saga is not about individuals but about institutions. The anxiety of the executive branch of being restrained which led to the 16th Amendment prompted the situation, and the judiciary’s last-ditch effort to save it from encroachment was the essence of the verdict. The fundamental issue, however, is the separation of power and whether the executive will have supremacy. Such contestation is neither new nor limited to any geographical region, but we witnessed at least three incidents where the executive branch blatantly used its power to tame the judiciary; in March 2007 Pakistani President Pervez Musharraf suspended Chief Justice Iftekhar Chowdhury making him a “non-functional CJ”; President Musharraf also asked the Supreme Judicial Council to investigate allegations of misconduct against him. After a prolonged legal process the Chief Justice was exonerated and reinstated. But in November, the CJ was replaced and forcibly removed from the court. While Pervez Musharraf used presidential power, in Sri Lanka Mahinda Rajapaksa used the parliamentary process in 2013 to impeach Chief Justice Shirani Bandaranayake and removed her from office. Financial impropriety was one of the charges. Both these justices were reinstated after a new government came to power; Chowdhury in 2009 and Bandaranayake in 2015. All these actions, in some ways, are reminiscent of the constitutional debate in India under Indira Gandhi, especially her party’s efforts to amend the constitution through parliament to strengthen her authoritarian government. These instances are indicative of an incessant battle between the executive and judiciary, particularly when the executive branch becomes authoritarian and considers the judiciary a roadblock to its desire for unrestrained power. The “Sinha saga” comes at a time when very little accountability of the incumbent government is left in the country. The parliament without any opposition, and the docility of the media and the society are the most obvious markers. Although the history of the nation tells us that the judiciary cannot claim that it had served to protect the disenfranchised all the time, it had remained the last hope at times of despair. Whether Justice Sinha intended or not, the unanimous verdict of the Supreme Court on the annulment of the 16th Amendment has become his legacy. The politics of the separation of power has reared its head one more time and the desire for power of the executive branch prompted actions. The question is, what lies in the future?